We are in the air en route to Frankfurt. No I am not posting from the plane; my wifi connection is not that good. We spent about 5 hours on the ground in Calgary. My brother Dave and his wife Caren live there and came out to the airport to pick us up and take us for a Thai lunch. I later got swabbed for explosives at the airport... Luckily I did not order my curry extra spicy. It was a nice albeit short visit. They were going to come our way later in June for a cruise out of Vancouver but we won't be there. After an in-flight meal of Soggy Noodle Beef Stroganoff I am that much more looking forward to Portugeuse and French cuisine. Heck I don't even care if it's cuisine. I am sure it will taste better. 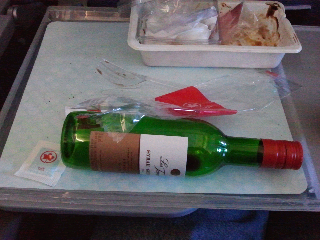 The wine was only ok because it was "free". We have 3767 more miles to Frankfurt, about 2 hours on the ground there and then another 2 or 3 to Porto. Numb Bumb already. Several hours later, after taxiing busing, moving sidewalking and hoofing it for a couple of km in the Frankfurt airport we are enjoying a frankfurter, pretzl and of course a beer... At 5:00 AM Vancouver time. The last flight today loads soon and leaves @ 13:20 local time, Porto arrival in about 2 &1/2 hours. Did you drink that whole bottle by yourself? All 4 ounces of it?